Chris Poole is a composer and one of Denmark's most original jazz flute players. 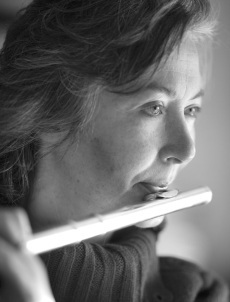 She is known from her many solo concerts where Chris Poole has developed her own personal style which she expresses in her improvisations and compositions for flute. She exploits the whole spectrum of traditionel and untraditional flute sounds in a merging of jazz, minimalism, world and modern compositions music. See the video To The Powers the Be made in collaboration with Baltic Sea Glass and the filmmaker Aimée Malte Harnes.